A few years ago, a Facebook friend posted pictures of her cross-country trip. She and her husband had gone to all sorts of interesting places, but when I saw the pictures of a certain red rock arch called ‘Delicate Arch’, I knew I had to see it too. 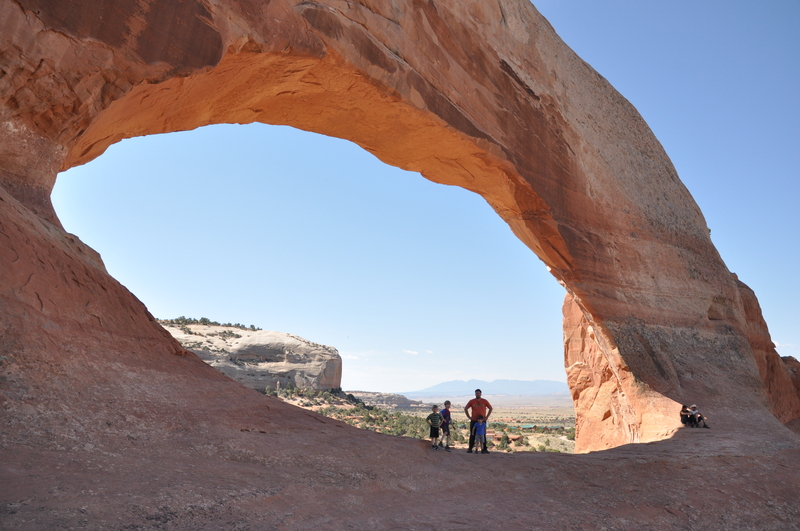 I did not actually know where in the world ‘Delicate Arch’ might be, so I consulted Google, offering best-guess search terms like ‘red rock arch’ which, perhaps not surprisingly, led me to search results for ‘Delicate Arch’, which turned out to be located in Moab, Utah. And so, over the course of two years, I managed to convince the professor that adding seven hours to our 30-hour drive, would be a worthwhile endeavor. Which is how we ended up driving south to go east on this installment of our Heartland Tour. I won’t lie, the driving sucked. And no one seemed to be having any fun. Which made me question my hair-brained scheme on more than one occasion. But then we got to Arches National Park on Sunday night and I saw the red rocks and knew the journey had been well worth it. Within a matter of hours, I, too would have pictures of ‘Delicate Arch’ on my camera. So we left the ‘memorable’ Horsehead Inn on Monday morning and made our [long] way towards the arch I’d been dreaming about for two years. The professor suggested we take a scenic road through Canyonlands National Park, en route to Moab. Reader beware: if you’re ever in a car with the professor and he uses the words ‘scenic drive’, run for your life. If running for your life isn’t an option, just know you’re about to forfeit 3 hours of your life. We certainly have our respective roadtrip quirks. I try to get out of the car at every possible chance: Tourist Traps. Fudge Factories. Grocery Stores. It doesn’t matter, I can’t stand to be in the car and will seize any opportunity to get out of it. Also, whenever the professor hits the brakes (which happens occasionally during a 5 day roadtrip), I tend to think he’s either lost or something’s wrong with the car. Coupled with my habit of sniffing the air periodically and saying ‘what’s that smell’ because I’m certain the gas tank’s about to explode or we’re burning rubber. So I realize I’m no dream travel companion, but this scenic drive business? It’s too much! 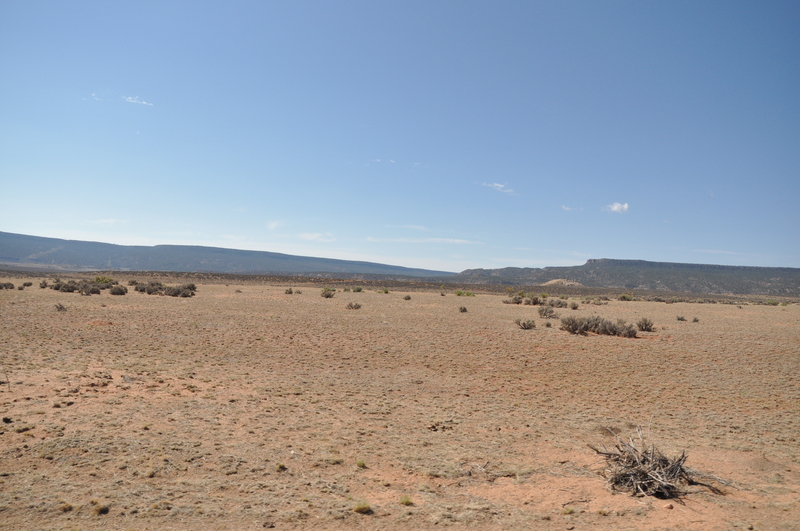 We drove through grassy-knoll desert country. And then we drove through more grassy-knoll desert country. And then we drove to Moab. And we stopped at Hole ‘n the Rock for our 12-minute tour and gift shop purchases. And then we stopped in proper-Moab for brunch at The Jailhouse Restaurant. And by the time we got to Arches, it was almost 2pm. And almost 100 degrees. And our evening destination – Denver – was a jenerous ‘five’ [eight!] hours away. So we blitzed through Arches to the Delicate Arch viewpoint and got out of the car-van. Unlike some of the other attractions, the Arch was not visible from the road. At all. ‘Strange,’ I thought. We followed the path and there – possibly 3 miles in the distance – was a speck of an arch, reminiscent of the photo my friend had posted on Facebook. 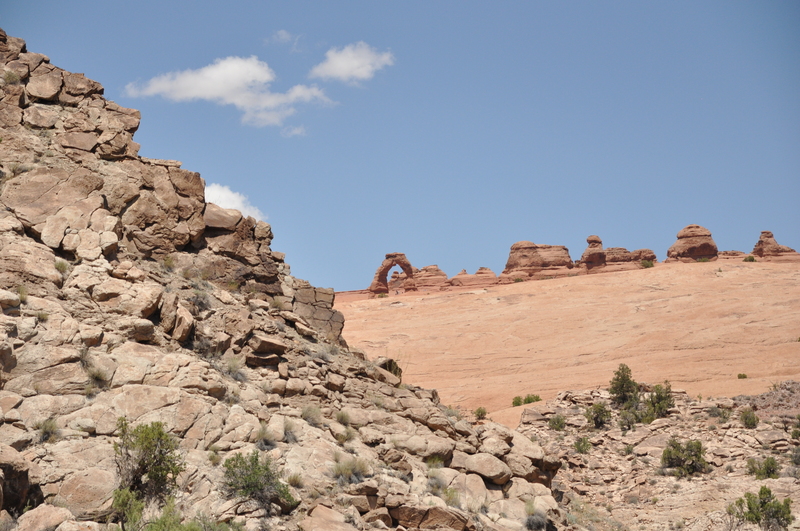 I entertained two possible scenarios: Was Delicate Arch……tiny? Did seeing (and photographing) Delicate Arch entail hiking miles through the desert in 100 degree heat? The trail with ‘access’ was a mile back. So we drove and I looked at the professor skeptically and he suggested I get out and read the sign to learn what we were in for. So that’s what I did, I hopped out of the car-van and I read the park’s sign about the Delicate Arch hike. 2 liters of water per person. I considered my options. Forget about the Arch? Hike to the Arch on my own – which, given the conditions, would take at least 90 minutes and would mean the professor sat in a van with the boys during that time. I nodded my head towards our red-cheeked, ill-tempered crew. ‘We can do it,’ he insisted. So we loaded a backpack full of water, which the professor carried, along with the camera. And I carried young Percy. And we set off for The Arch. The heat was vile. And our oldest, alabaster boy-child, who was done with all things desert at that point, was incapable of handling it. After walking about 30 minutes, the professor determined he would return to the car with Percy and the Gort. For while Percy was perfectly happy to be on the walk, he didn’t want to actually do any walking. I continued in my journey to the Arch with the surprisingly energetic Hen at my side. And with that information, I told the Hen we were turning around. love this! miss your blog. some day i’ll have time to just sit and read. maybe you’ll have your book published at that point, and I’ll keep a copy with me wherever I go! Rachel, your comment totally made me want to see a moonbow…….